The visual arts world is all abuzz about performance. Or Londoners certainly are. 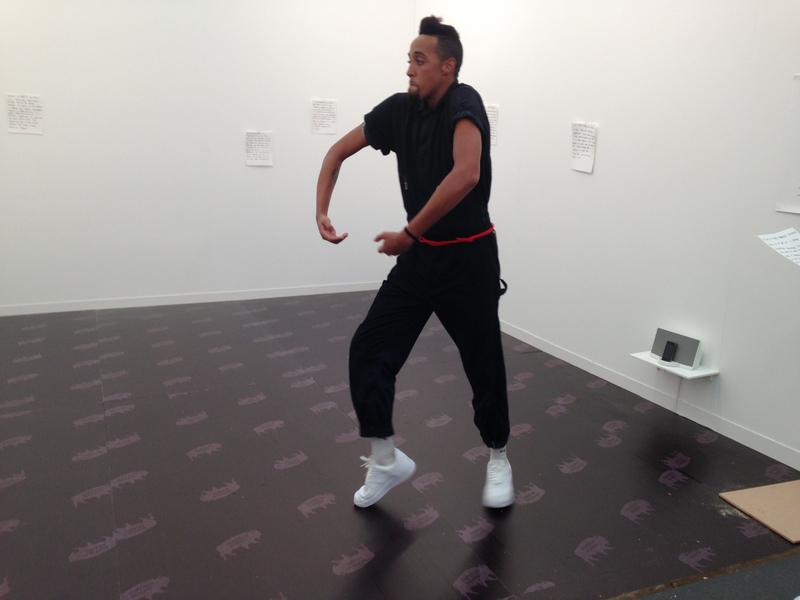 At Frieze, there were a number of stands for galleries featuring performances, as well as commissioned Frieze Projects where dancers and actors were centre stage throughout the art fair. Australia Council was in on the action with a grant for Silberkuppe Gallery to stage Adam Linder’s work. This was actually the most compelling activation I saw, as Linder and his companion are beautiful movers and their call and response improvisation with text in the all white space of the Berlin based gallery’s stand, was simple and compelling. I found some of the work, featuring blank-faced dance students in primary coloured unitards to be pretty blah, but was intrigued to see such a focus on performance wherever I turned. The Hayward Gallery’s major new show, Mirrorcity, features work curated by my good colleagues Frank Bock and Martin Hargreaves. At ICA, a whole week of activity took place at ICA Offsite, in the old Selfridges hotel off Oxford St. I watched Siobhan Davies dance company do a very rigorous and thoughtful kind of lecture-dem entitled Table of Contents. At The Serpentine there was a weekend of talks and performances called The Extinction Marathon, featuring several dance and theatre artists. At Chisenhale Gallery in the messy Ed Fornieles installation, live actors animated the sets and at ShowRoom Gallery a group of dancers performed an hour long interview about politics in a stunningly staged film by Grace Schwindt. I met with several live art colleagues, including Jane Greenfield from Home Live Art and Lois Keidan from Live Art Development Agency as well as Kate Coyne from Sioban Davies Dance Company and all were bemused by this development.